We’re looking at a brief, but none-the-less significant, tune from one of the world’s leading fingerstyle guitarists. Ladeez and gentlemen, Alex de Grassi… With an Italian family history, Japanese birthplace, and Californian upbringing, Alex de Grassi brings a wealth of musical influences and cultures to the acoustic guitar. One of the original “Windham Hill” guitarists, Alex’s debut album Turning: Turning Back (1978) was a milestone in the development of the art of contemporary fingerstyle guitar. With each new release, De Grassi unveiled a widening range of musical colours, from the folk and blues influences of his early recordings through classical and ensemble forms, into Latin and jazz settings. The common threads binding all these elements together were the composer himself and the trusty steel string acoustic guitar. His latest album, Bolivian Blues Bar, is out on Narada, and is a natural progression on Alex De Grassi’s musical journey. Just as he explored Latin rhythms and textures on his 1993 album The World is Getting Loud, here he is heard giving some jazz standards the classic De Grassi treatment. Transcription is taken from Alex’s 1991 album Deep at Night. The track ‘Short Order’ is literally just that – it comes in at just under two minutes. However, in those 79 bars he packs a musical punch. The piece is in DADGAD tuning. After a bluesy introductory bass line, Alex introduces the main theme. Based primarily in D harmonic minor, the rhythmic phrasing of the chords will require the most attention. In fact, in recent performances Alex has altered the chord voicings but the rhythm remains unchanged. I suggest that you practise bars 9-12 in a loop until you are really comfortable with the phrasing. 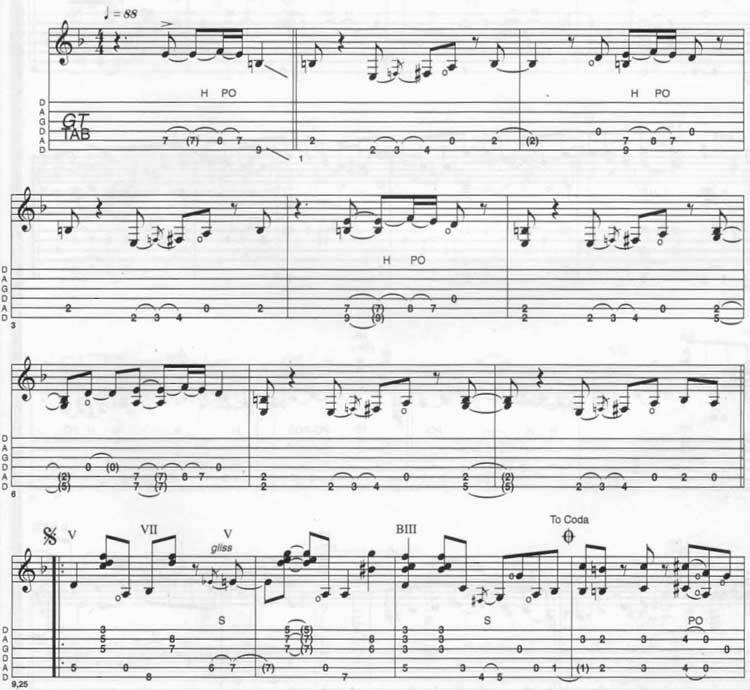 The second theme appears in bar 17 and, again, I suggest that you loop the first four bars of it until you are comfortable and familiar with the phrasing. These are the two main themes and both appear again a number of times in the piece. The C section is bars 41-46 and is characterised by bluesy bass runs interspersed with natural harmonics. From bars 47-59 Alex plays an improvisation on those ideas and brings the tune back into the B section and the A section for the last time. He suggests that the player either omits these bars or plays their own improvisation instead. Alex closes the piece with the original introductory bass line and finishes on a funky sounding D#9b9b13 (not as tricky to play as it is to spell, fortunately). It’s just a part of Alex De Grassi Short Order guitar tab and sheet. © 2012 - 2019 TabsClub Powered by TabsClub 42 queries in 0.338 seconds.